You'll be £19.99 closer to your next £10.00 credit when you purchase Under A Bomber's Moon. What's this? Order within the next 2 hours, 27 minutes to get your order processed the next working day! They were the best of enemies – dedicated, skilled and deadly. In the night skies above wartime Germany an RAF navigator-bomb aimer and a Luftwaffe pilot sought out their targets, testing the gap between success and their own destruction as they crossed each other’s paths. The odds were heavily against either of them making it through the war, but as the sobering realization displaced their initial exuberant sense of adventure, both came to see in their youthful sacrifice the survival of all they held dear. 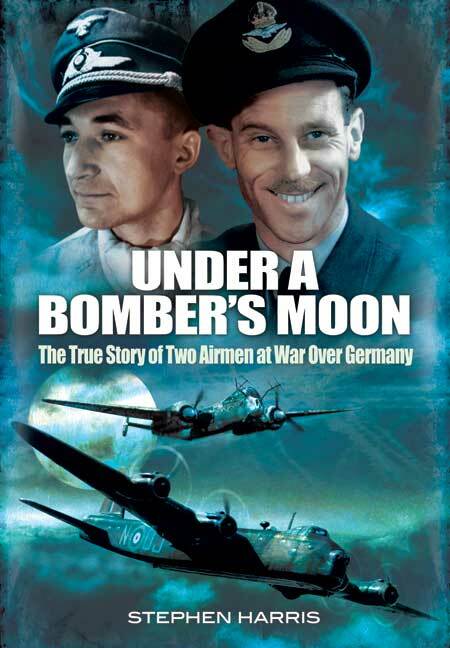 Under a Bomber’s Moon reaches across the divide of years, of geography, of nationality, to tell their story largely in their own words – describing both the breathtaking clashes in the air and the camaraderie, humour, patriotism and personal tragedies that became their war. Stephen Harris began his journey of discovery because he wanted to know the truth of his great-uncle Colwyn Jones’s fate. With Col’s vividly written letters and diary as a startingpoint, he set out to discover what really happened on the night Col’s extraordinary luck ran out. Little did he know that his quest would lead him to a meeting with a former Luftwaffe pilot who was pitted against his great-uncle in the skies over Germany. Otto-Heinrich Fries proved to be both engaging and articulate, eventually allowing Harris to tell his story in this book. The result is a unique and personal account of two highly successful airmen from opposing sides. An interesting piece of background to the strategic bombing offensive over Germany.